The 207 yard Par 3 fifth hole is designer Gary Player’s signature hole on the Cascades Championship Golf Course. An elevated tee looks across deep blue pools of water, down to a narrowing headland, home to the green. In many ways, this is designer golf. There is a question that defines you as a golfer, perhaps revealing your life philosophy. 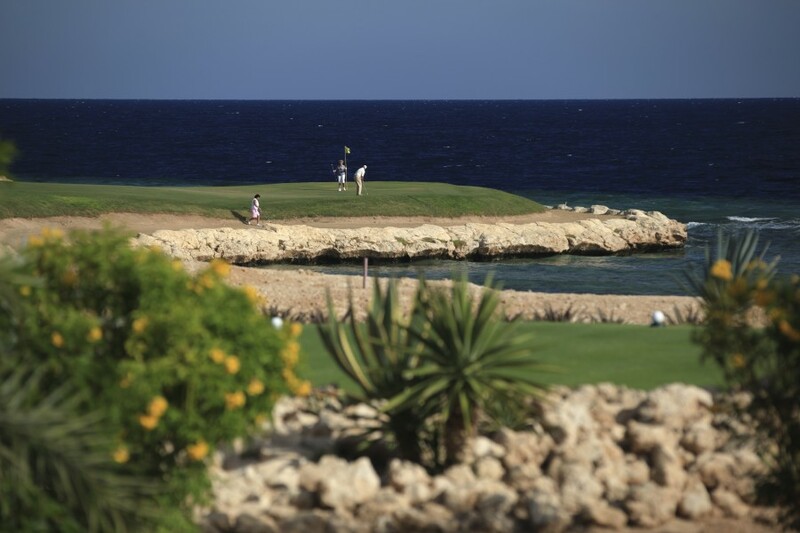 Do you take a cautious inland approach, conservatively targeting a wide fairway and settle for a bogey four? Or – hoping for a Par 3 or better – do you boldly cut the corner, across the sea, and gamble with the blustering northern winds. 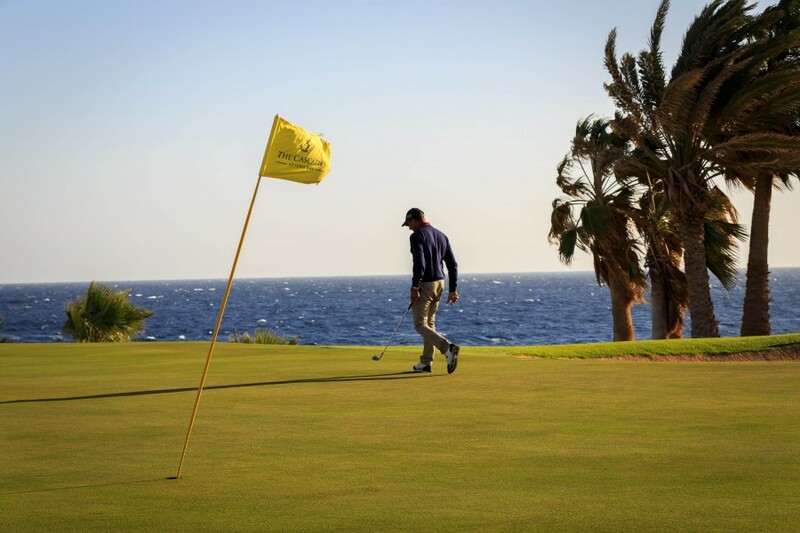 A wind, surprisingly without a name, that races down the Gulf of Suez coastline drawing your ball out to sea. Throw-up a fragment of palm frond into the air, watch the Ravens riding the ever-changing thermals and make your decision. Or wait 30 seconds for the capricious winds to subside. 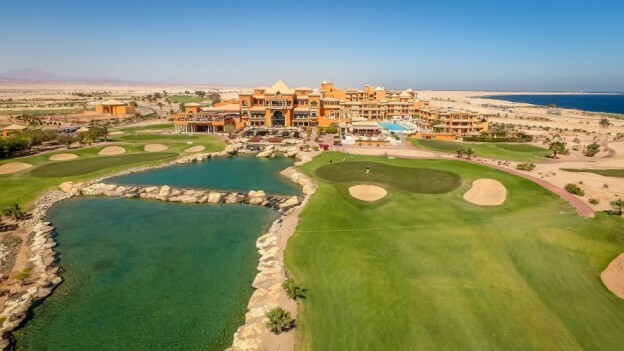 No wonder this course hosts the Egyptian Championship. Think Augusta, without the azaleas, but with considerably more sand and a smattering of palm trees. “It’s a links course. 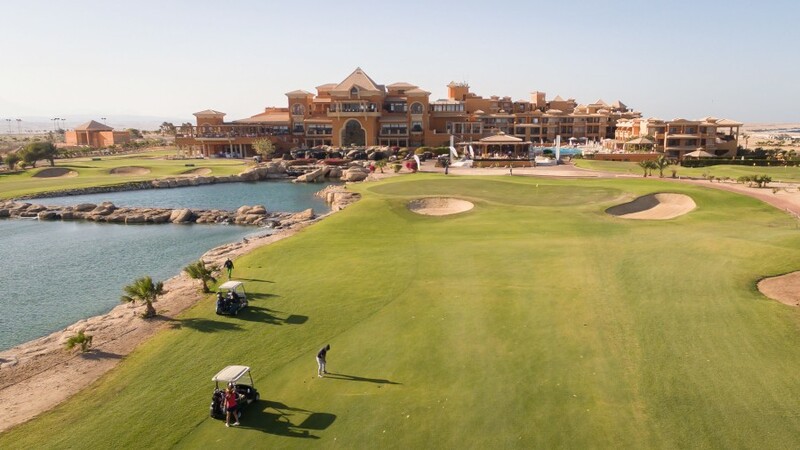 It’s windy,” says the walnut-skinned Mohammed “Major” Mansour who commands the fleet of golf carts, the Golf Academy and the desalination plant which delivers 10,000 cubic litres of desalinated water per week. The Major’s empire is growing, 30 more golf carts will arrive soon. Somabay is on a roll, visitor numbers increased by 110% last year. “But sometimes I have my worst rounds when the wind drops. I am used to battling the winds and my concentration goes,” the Major says with a tone of disappointment. 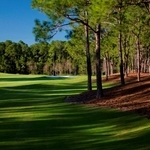 “First encounters” the Par 4 first hole emphatically announces the course’s personality. Drive across “a waste bunker”, in fact, it is the indigenous gritty desert, to reach the safety of the fairway, hopefully avoiding bunkers with Saharan sand dune elevations. Gary Player has probably designed more bunkers than I’ve had drinks in the Club House. Like most great golf courses this one has a touch of Jekyll and Hyde schizophrenia. Amiably it smiles on you, if your ball sits up proud and inviting on the spiky, almost plastic fairway grass. Yet menacingly to the right of the green, an ominous water hazard waits. To the left yet more sand. If you’re sweating nervously by the time you’ve completed the fourth a gazebo with a chilled flannel and iced drinks awaits you. This is luxury golf. Time your first nine so that you can take lunch at the elegant Spikes restaurant and bar: look out for the seafood specials board. And remember this is Egypt, you can afford the lobster. To your left are the sparkling waterfalls that give the course and hotel their name. Alternatively, if you are staying at the spacious hotel that is the Cascades Golf Resort, Spa and Thalasso you could fit in the front nine before breakfast. That’s a cool strategy in the hotter summer months. Over al fresco breakfast, on the buffet restaurant’s terrace, you can reflect on your performance on the second hole, named “Bunker Alley”. With a narrowing fairway, this Par 4 certainly deserves its stroke index 1 ranking. Nor would there have been any respite on the third, poetically named “Lions in Waiting”. Once you’ve finally stroked your ball 614 yards – no that is not a misprint – from black championship tee to hole, possibly for a Par 5, look up. 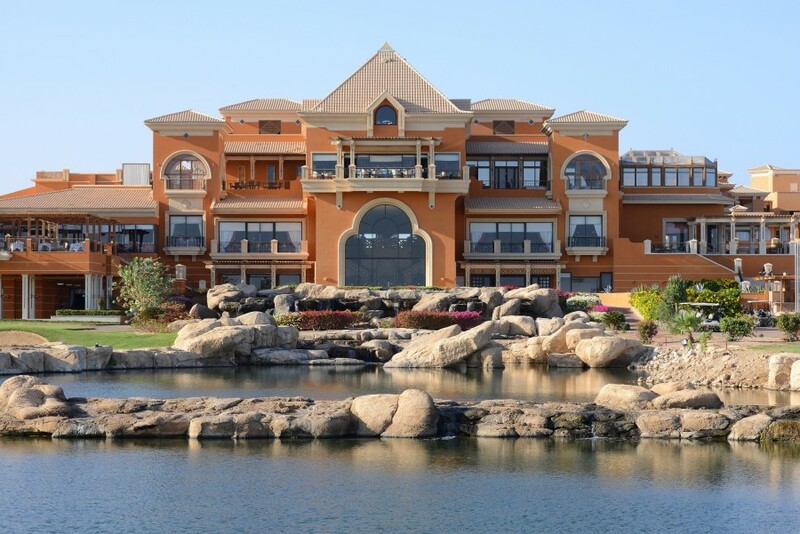 In the distance, you will see the two giant Sphinx guarding the entrance to the Sheraton Somabay Resort. They are the waiting lions. For fair weather golfers the Cascades Championship Course is the Promised Land for warm winter golf. During the “winter” the Academy has three Professionals on hand to tackle your slice/hook/putting yips – please delete as appropriate. There’s a Par 3 nine-hole course for working on the short game. 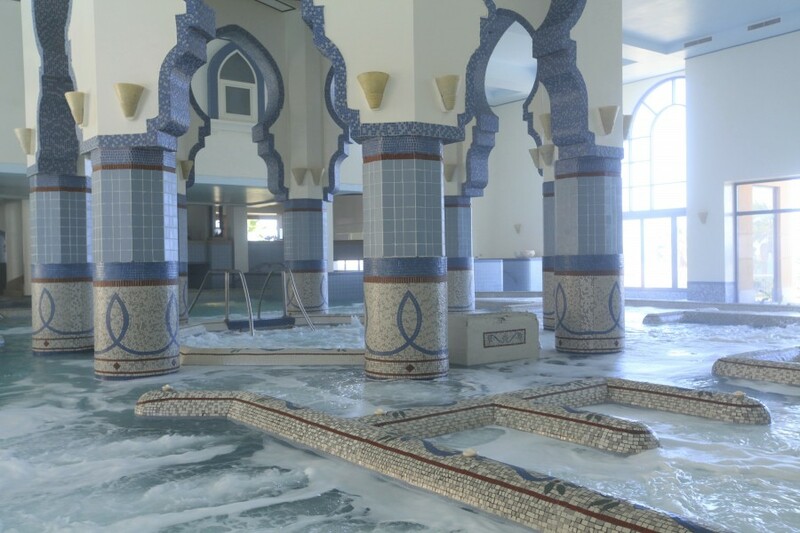 And if it’s injury or muscular stiffness that are holding back your game, rather than technical failings, at the Cascades Spa and Thalasso there are 65 treatment rooms, some even offering a specialist golf massage. The Cascades Championship Golf Course. Hotel residents can play the 18 hole course for €85, non-residents for€90. Golf cart rental for 18 holes is €30 whilst Club hire is €25. A package of five 18 hole rounds for €120 is available for residents.